Chicago and North Western Railway, Route of the "400"
The definition of granger is a farmer or homesteader. The term also describes those railroads which served America's breadbasket and derived a substantial portion of their annual revenue from the movement of agricultural products. One of the most fondly remembered was the Chicago & North Western which maintained a sprawling network of more than 11,000 route miles across Wisconsin, Iowa, Nebraska, South Dakota, Illinois, Missouri, Michigan, and even reached North Dakota and Wyoming. Like all grangers it maintained hundreds of miles of secondary trackage that were lightly patronized by the postwar period but absolutely fascinating to witness. In few other places could one watch a passing freight bobbing along rickety, weed-covered trackage to serve a nearby grain elevator or local customer. While a joy to see in action these branches were a serious drain on a railroad's bottom line. With the industry's deregulation in 1980 many such unprofitable lines were rightfully abandoned or sold to short line operations. The C&NW struggled during the 1960's and 1970's but regained its footing in the 1980's with the rise in Powder River Basin coal. 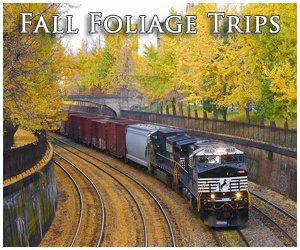 This clean-burning natural resource brought about a renaissance that led to its purchased by Union Pacific in 1995. From an operational standpoint, most of today's big Class I's lack much character; the locomotives largely all look the same, freights are unit consists, and few locals are dispatched. This was not the case years ago. The Chicago & North Western, for example, was a railfan's paradise where one could witness heavy ore moving out of Michigan's Upper Peninsula, watch time freights blaze across the prairie, enjoy Alco's burbling past farms, and observe the elegant '400's' speeding between the big cities. In Paul Schneider's article, "North Western Odyssey" from the March, 1996 issue of Trains Magazine, the C&NW held a unique distinction as being one of the last to continue operating diesels from all five major manufacturers (Electro-Motive, General Electric, American Locomotive, Baldwin, and Fairbanks-Morse). In later years it became known for maintaining locomotives far beyond their expected service lives; former Chicago Great Western covered wagons, for instance, soldiered on in freight service long after C&NW had retired its own F units. In addition, rebuilt first-generation Geeps could still be found working into the 1990's. The company developed an identity uniquely its own. Until 1955 the C&NW also forwarded the Union Pacific's City fleet to Chicago, after which time the Milwaukee Road handled such duties. 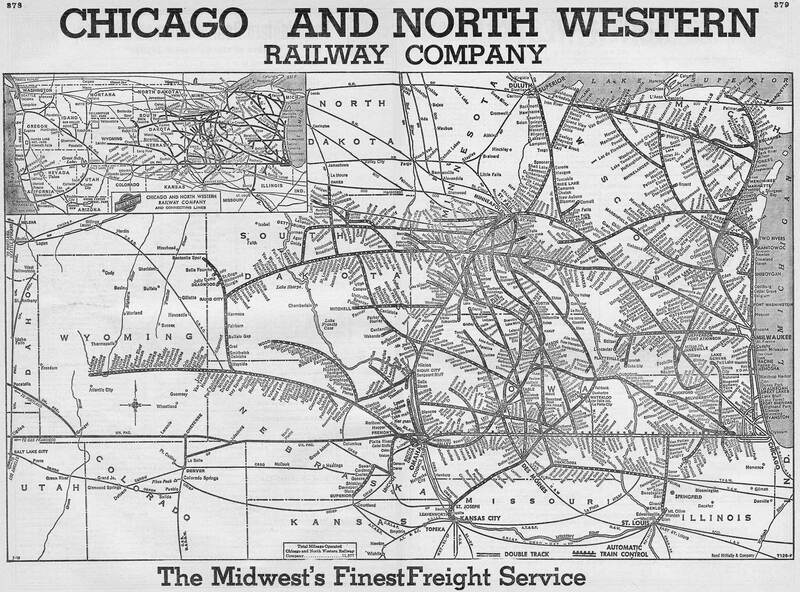 The Chicago & North Western's earliest predecessor was the Galena & Chicago Union chartered in 1836. The G&CU is notable as not only being Chicago’s first railroad but also the first to operate a steam locomotive out of the city. The railroad, intending to connect its namesake cities and reach the Mississippi River, had trouble right from the start; while surveying was carried out no construction took place and the project stalled. In 1846, it was taken over by a new group with the financial wherewithal and determination to see it completed. Work began in June of 1848 and by January 22, 1850, 42 miles had been opened to Elgin. The project had only been under way a few months when the first locomotive arrived by schooner on October 10th, a 4-2-0 named the Pioneer. It was placed into service on October 24th, earning it the distinction as the first to operate out of Chicago. The new promoters were successful in their gamble; behind a growing city the railroad earned a profit right from the start. Agriculture played a large part in this and continued to do so for more than a century under the C&NW. By September of 1853 the G&CU had opened to Freeport but failed in reaching Galena. As Tom Murray notes in his book, "Chicago & North Western Railway," the Illinois Central had arrived here first, forcing the G&CU to rely on an interchange connection (the C&NW would eventually establish its own route to Galena). A History Of The Fabled "Cowboy Line"
Like other such branches the Lander Line was hurt considerably by improved highways and the growing trucking industry after World War II. As freight declined the corridor became an unwanted appendage and deferred maintenance witnessed trains creeping along as slow as 10 mph in some locations. By the 1970's a new, lucrative business appeared in the West, Powder River Basin coal out of Wyoming. First served by Burlington Northern and growing in demand thanks to its clean burning properties the C&NW’s Cowboy Line lay strategically within reach of this traffic. However, it would need hundreds of millions of dollars in upgrades to handle the many heavy coal trains running the route daily. At the time the railroad simply did not have this cash available. It initially attempted to work with BN. Ultimately, as a means of gaining needed financing Union Pacific became involved. With help from this profitable carrier a new 55-mile connector between the western end of the Cowboy Line and a nearby UP route gained the two railroads access into the Basin. It opened in 1984. The decision proved less expensive and decided the future fate of the Lander Line. Following a few years of additional use the C&NW petitioned the Interstate Commerce Commission (ICC) to discontinue service on the Cowboy Line between Norfolk and Chadron. The ICC would eventually grant abandonment of the route as far west as Merriman and the last train over the line ran on December 1, 1992. Since then, most of the remainder of the old route has also been pulled up by various parties and is now part of the Cowboy Trail. The CStP&FdL had been formed on March 31, 1855 through the merger of the Illinois & Wisconsin and Rock River Valley Union Railroad. 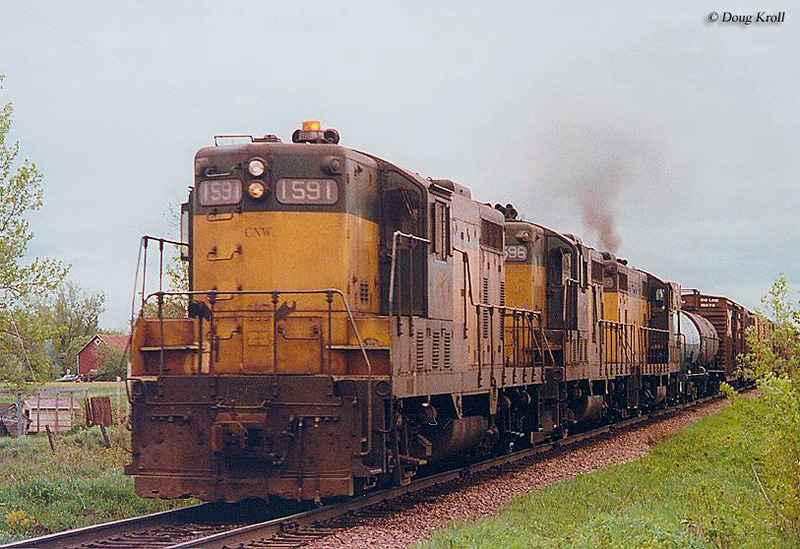 The two operated modest, but disconnected networks at the time; the I&W ran between Janesville, Wisconsin and Chicago while the RRVU served Fond du Lac and Watertown. Naturally, plans following their marriage included closing the gap but the new road fell into bankruptcy before this was accomplished. The property was then acquired by businessman William Ogden who formed the Chicago & North Western Railway in June of 1859. Long considered the father and architect of the modern C&NW, Ogden quickly completed the Watertown to Janesville segment and then embarked upon a great railroad expansion across the upper Midwest. With a region rich in timber and agriculture Ogden, using either the C&NW or another subsidiary, pushed rails to Oshkosh (1859), Fort Horward which later became Green Bay (1862), and established service into Michigan's Upper Peninsula at Escanaba and Negaunee (near Ishpeming). By this point the C&NW and G&CU were interchange partners and before long a merger was being considered. The union was approved in 1865. 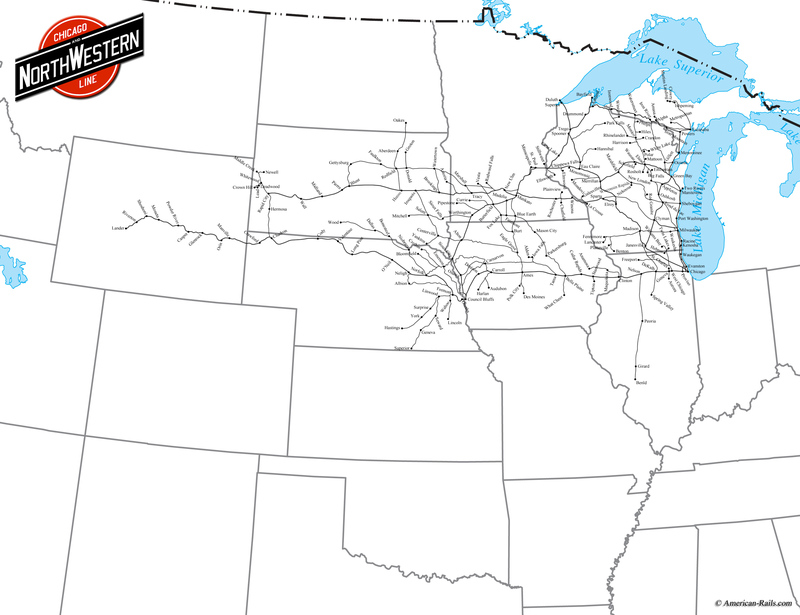 The new C&NW became an instant 850+ mile system and one of the Midwest's most important. Ogden remained with the company until the summer of 1868. His phenomenal success had been largely due to quick thinking and an understanding that surrounding competitors like the future Milwaukee Road, Burlington, and Rock Island, would render his railroad obsolete if it was not constantly expanding. He envisioned the C&NW as a major player and so, too, did his successors. After Ogden's departure the company continued its march across the Midwest. There were countless small companies gobbled up during the latter 19th century; names like the Chicago & Milwaukee, Winona & St. Peter, Iowa Midland Railway, and North Western Union Railway. There were even a handful of narrow-gauge operations such as the Crooked Creek Railway & Coal Company; Covington, Columbus & Black Hills Railroad (3-foot, 6-inch); Galena & Southern Wisconsin; and Chicago & Tomah. Many of these comprised its numerous secondary branches that a century later were an unwanted, money-losing nuisance. However, during a time when almost everything moved by rail they helped make the C&NW a prosperous carrier. 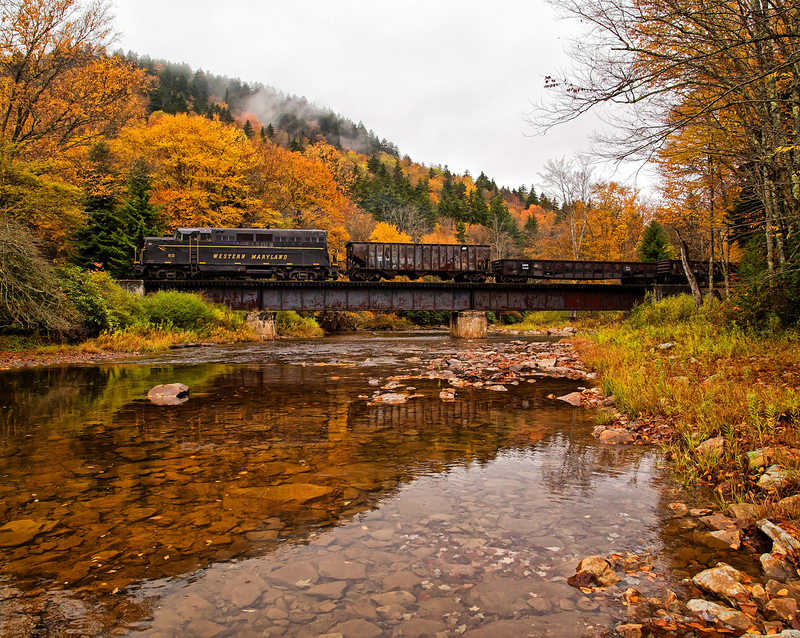 By 1880 the railroad maintained a 2,500-mile network and just a decade later blossomed into a 4,2000-mile behemoth. Two of the C&NW's most noteworthy acquisitions occurred during its final years of expansion; the Chicago, St. Paul, Minneapolis & Omaha Railway ("The Omaha Road") and Fremont, Elkhorn & Missouri Valley Railroad. Historian, H. Roger Grant, offers an excellent account of the CStPM&O in his book, "Minnesota's Good Railroad: The Omaha Road." The system was formed in 1880/1881 when a group which controlled the North Wisconsin Railway, West Wisconsin Railway, and St. Paul & Sioux City Railroad merged the trio into the Chicago, St. Paul, Minneapolis & Omaha. Within a year of this transaction the C&NW gained stock control during November of 1882. 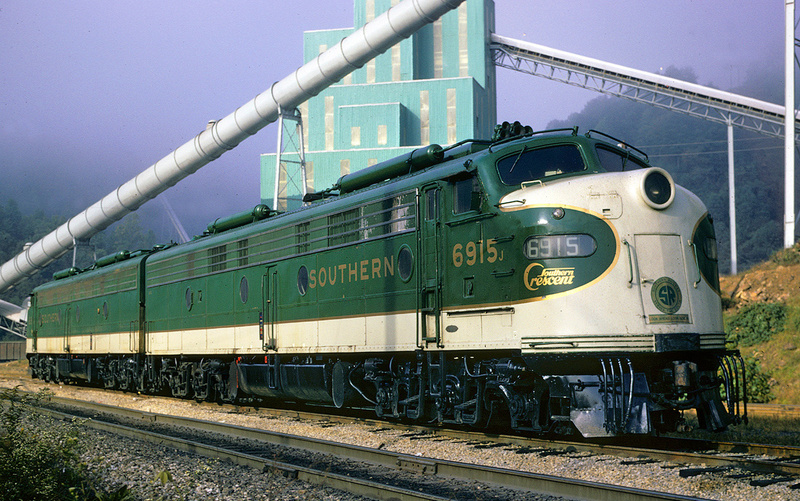 The CStPM&O provided the North Western with its main line from Chicago to the Twin Cities, connection to the ore docks at Duluth/Superior, a secondary route into Omaha, and a link to Sioux City, Iowa. At its peak, just prior to World War I, the Omaha Road boasted a 1,700-mile network. Interestingly, it remained a C&NW subsidiary until 1972. You can read much more about the FE&MV in the inset article above entitled, "A History Of The Fabled 'Cowboy Line'." The railroad, formed in 1869, was acquired by the C&NW in 1884. It began a westward expansion that had reached western Wyoming at Lander by 1906. The North Western intended to reach the west coast but, unfortunately, never made it beyond Lander. The railroad at this time was essentially in place maintaining a network of 7,450 miles which connected Chicago, Omaha, the Twin Cities, Milwaukee, Duluth/Superior, Rapid City, and many other points. It would not see further growth until the post-World War II period. As the below, 1969 map attests the North Western's spaghetti-like system was so thick in the states of Iowa, Minnesota, and Wisconsin that in some spots different branch lines were not separated by more than ten or twenty miles! As growth slowed the focus turned to upgrading the railroad; by 1902 the Council Bluffs-Chicago main line was double-tracked, signaling systems put into place, bridges rebuilt, and the infrastructure overhauled to support heavier and longer trains. Later, in 1929 it opened the massive Proviso Yard located in western Chicago which at the time was largest terminal of its type in the country. The Great Depression, which hit the nation hard following the October 29, 1929 stock market crash was extremely taxing on the C&NW. It was not alone as most other carriers had felt the sharp business declines within a few years. In Gregory Schneider's book, "Rock Island Requiem," the author points out that through 1936, 70,00 miles of railroad was in receivership. The North Western fell into bankruptcy on January 27, 1935 and would not emerge until the great surge of traffic brought about by World War II, finally exiting judicial oversight on June 1, 1944. 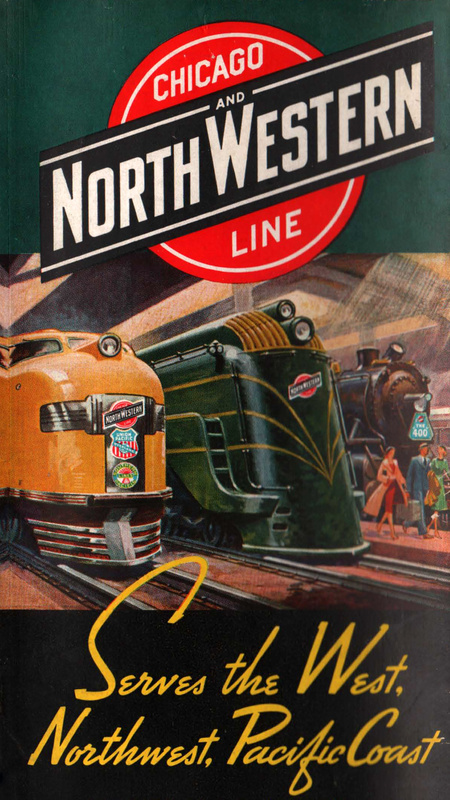 For the general public the C&NW's most visual change, ironically, took place during its bankruptcy years with the introduction of flashy, colorful, and fast streamliners. The company, whether interested or not was nevertheless caught up in the nationwide fervor. Union Pacific unveiled the first-ever such trainset in February of 1934, followed by the Chicago, Burlington & Quincy a few months later. These new contraptions were a stark change from the traditional drab, colorless, and utilitarian appearance trains had always employed. The public was duly impressed and the streamliner craze was underway. 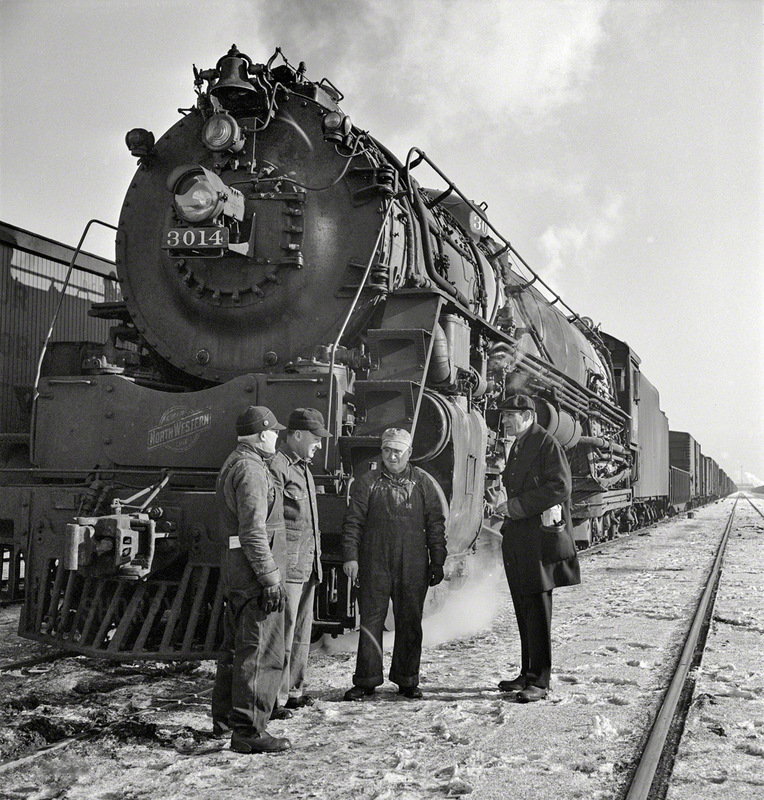 Realizing they were on to something, officials at Union Pacific wanted to launch a transcontinental service to Chicago. 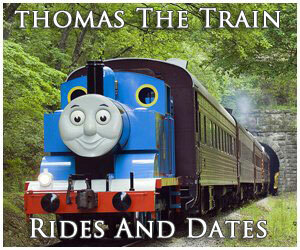 Since the C&NW had long worked with UP as its Windy City gateway it agreed to the new service. In addition, the Burlington and Milwaukee Road were gearing up for their own streamliners in the hotly contested Chicago-Twin Cities market. Following the CB&Q's debut of its Zephyr trainset the railroad introduced regular service to this corridor in April of 1935. It was followed a month later by the Milwaukee's legendary Hiawatha. The North Western, in effort to keep up, began upgrading its main line for high-speed operation. As Mike Schafer notes in his book, "Classic American Railroads," since the C&NW's Chicago-Twin Cities route was roughly 400 miles and the service scheduled for around 400 minutes the new train was given the name '400.' The only catch, it was originally not streamlined; due in part to its ongoing financial situation the railroad had to utilize a quartet of overhauled (non-shrouded) 4-6-2's (E-2a). To increase their speed the Pacific's were rebuilt as oil burners, given larger driving wheels, and carried bigger tenders among their more notable improvements. In addition, heavyweight cars were upgraded with better suspension and other perks. The '400' officially launched on January 2, 1935 and proved successful enough that new streamlined equipment and sleek Electro-Motive E3's arrived in 1939. Eventually, a fleet of '400's' was unveiled across the Midwest. Surprisingly, they were actually not C&NW's official introduction into the streamliner age. Following their agreement, UP wasted no time in launching its transcontinental services, acquiring its first trainsets from Electro-Motive/Pullman in June of 1935. As trains like the first-class City of Los Angeles, City of Portland, and City of San Francisco grew in popularity conventional lightweight equipment (non-articulated) arrived for these services through the 1940's. New diesels continued streaming in during the postwar years until steam had been retired completely by 1956. Unfortunately, this period began a long slide for the railroad. Its revenue ton-miles dropped by 1 billion in just seven years between 1946 and 1953 and with an overbuilt network that totaled more than 9,400 miles deferred maintenance was carried out in an attempt to cut costs. Employing such a tactic is never a sound business strategy in the long-term, which actually results in a railroad spending more money than it saves due to increased derailments and slower running times. 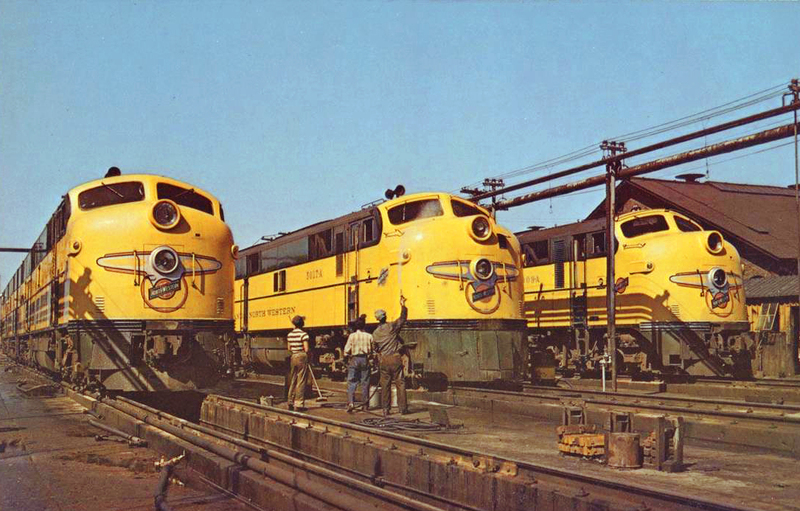 The C&NW's declining physical plant caused Union Pacific to switch its Chicago connection for passenger services to the Milwaukee Road, effective October 30, 1955. 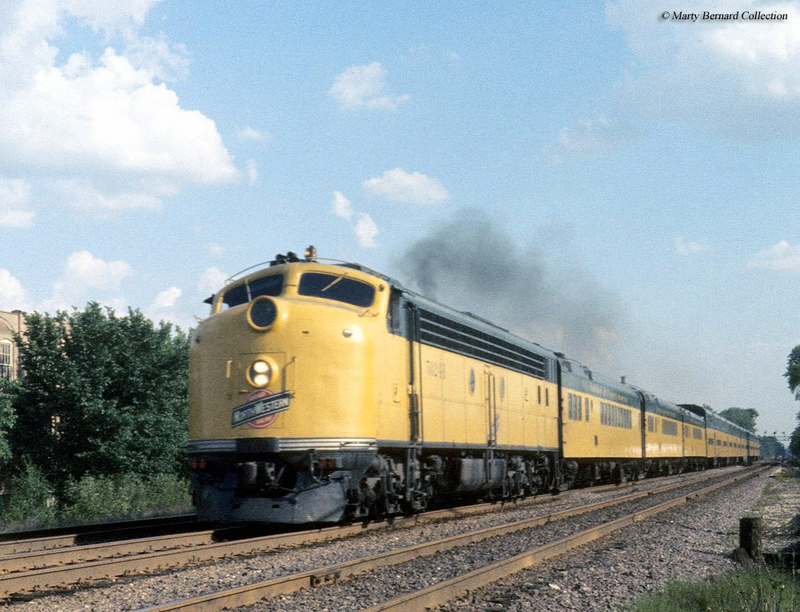 In 1963 the railroad discontinued its Twin Cities '400' and the '400' name disappeared entirely by 1969. As bad as things were through 1956, when the company reported losses of more than $5 million, new management under president Ben Heineman did help improve the situation. In just two years the railroad was again showing a profit although the heavy concentration of light density branches persisted. For Heineman's successes he had little effect on reducing the secondary trackage. The problem was not entirely within his control. Prior to deregulation it was nearly impossible for railroads to successfully petition the Interstate Commerce Commission in abandoning excess capacity. However, in a way Heineman magnified the issue by acquiring a series of smaller systems beginning with the Litchfield & Madison in 1958. This small, 44-mile pike was actually a good investment providing the C&NW direct access into St. Louis. 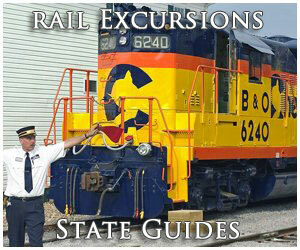 However, in 1960 it acquired the nearly 1,400-mile Minneapolis & St. Louis Railway. The Peoria Gateway was essentially just another granger, connecting Peoria with the Twin Cities, parts of Iowa, and stretching into South Dakota. Later that decade, in 1968, it picked up another of about the same size, the Chicago Great Western. 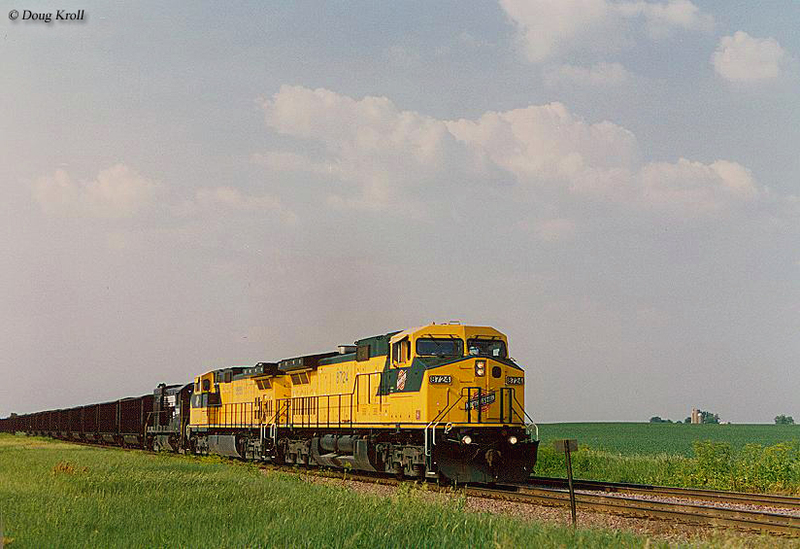 The Corn Belt Route was also a granger but did connect more noteworthy markets including the Twin Cities, Chicago, Omaha, and Kansas City. 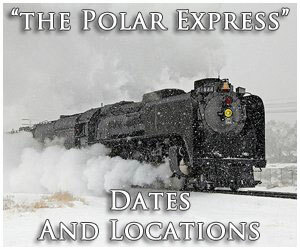 That same year C&NW added a former interurban, the 110-mile Fort Dodge, Des Moines & Southern ("The Fort Dodge Line"), as well as the 36-mile Des Moines & Central Iowa Railway. With these takeovers the North Western ballooned into a 11,500+ mile network. Historians have questioned the strategic nature of these moves; the railroad sold or abandoned much of each system afterwards and only the L&M and Great Western offered markets the railroad did not already serve (St. Louis and Kansas City). During the diesel era, Chicago & North Western's propensity to maintain first-generation models long after many others had retired theirs earned it the less-than-flattering title, "Cheap And Nothing Wasted." However, there was a method behind this madness. 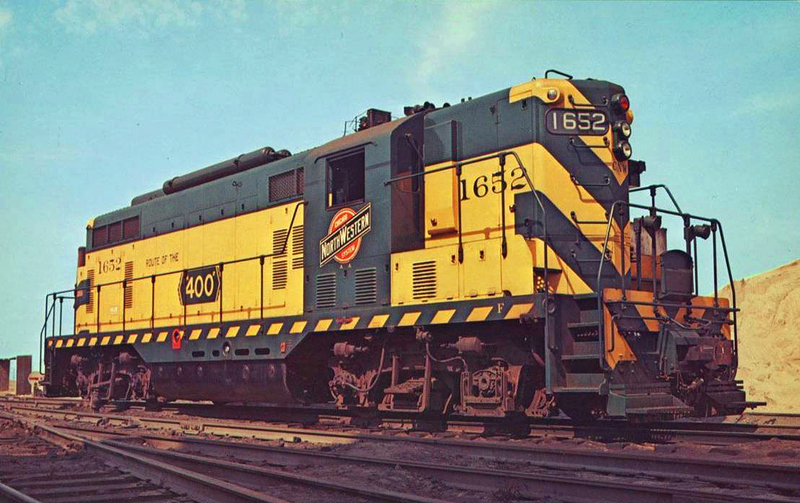 Not only was the C&NW able to extend the service lives of these locomotives, particularly Electro-Motive units, but the railroad also generally assigned blocks of the same builder's models to various divisions or regions. This insured that, while the mechanics and crews may not have always liked them (U30C's, for instance, were loathed), maintenance would be streamlined. 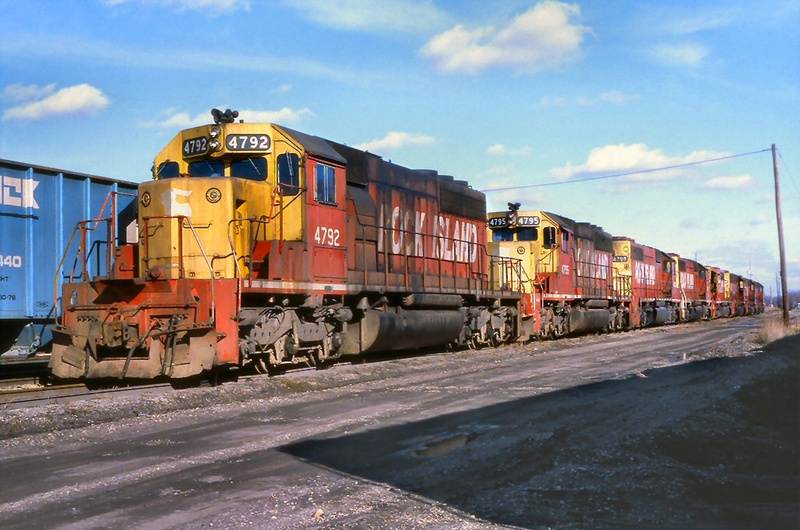 For those who love Alco's, the secondary main line from Winona, Minnesota to Rapid City, South Dakota was the place to be in the 1970's. 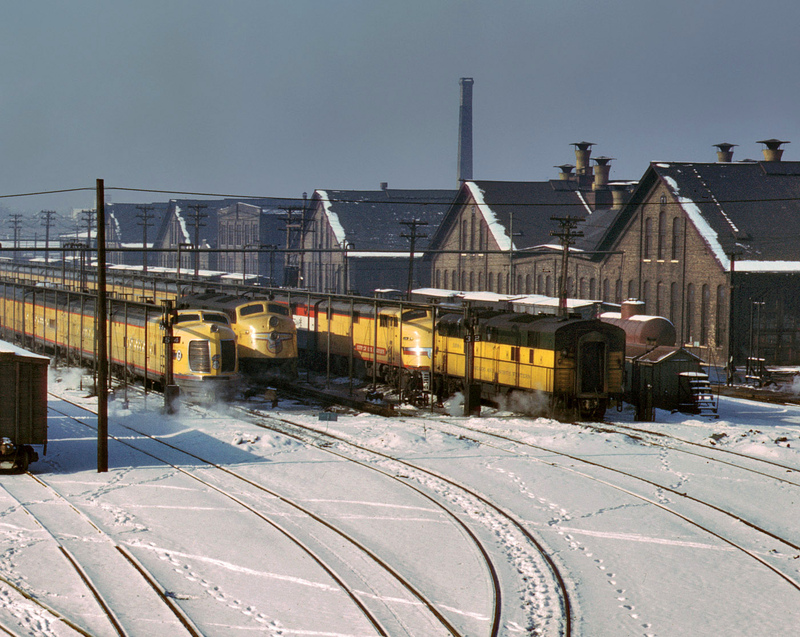 The so-called "Alco Line" was a paradise of Schenectady splendor; burbling, belching models like the RS11, RS3, RSD4, RSD5, C425, RS36, and others were a common sight here. Adding to their charm was their greasy, grimy appearance and the bucolic Midwestern settings in which they operated. Alas, the road eventually retired their Alco's and the "Huron Main" totaling 826 miles, including branches, was sold to new startup Dakota, Minnesota & Eastern in 1986. The 1960's began a new era for the C&NW. In an attempt to reduce excess capacity it began focused discussions with the transcontinental Milwaukee Road concerning merger. The two had discussed the subject since the 1930's but never seriously considered the proposition before that time. Ultimately, the latest talks ended once more without an agreement and each went their separate ways. Then, during the 1960's the C&NW formed a new subsidiary known as Northwest Industries. Many railroads at the time were creating these paper corporations as a way to boast earnings by acquiring companies in markets/industries outside of railroading. In the process it allowed them to escape ICC oversight. Before long, NWI wanted out of the high cost/low profit and cyclic nature of the railroad business. Thus, a plan was hatched to have C&NW employees, themselves, own the company. On June 1, 1972 the Chicago & North Western Transportation Company was born and acquired the railroad's assets. It then embarked upon a campaign of selling or abandoning thousands of miles of light density lines, increase earnings, and finding a way to lower its phenomenally high operating ratio which hovered at around 90%. The company also upgraded its most important routes and worked to enter Wyoming's growing Powder River Basin coal seams. As the above, inset article notes the C&NW's own Cowboy Line lay directly within the heart of this lucrative natural resource. However, the corridor had been so badly neglected over the years it could never handle the required tonnage. To sidestep this issue the C&NW worked with Union Pacific to build a new connector from the UP to the western end of the Cowboy Line. As coal became an increasingly important business model the roads worked ever-closer together. In the meantime the C&NW continued shedding hundreds of miles through the early 1990's. These efforts, according to Michael Blaszak's article, "Chicago & North Western: Evolution Of A Survivor," from the April, 1994 issue of Trains Magazine, reduced its network to just 4,323 route miles. In a move that surprised few, Union Pacific acquired control of the Chicago & North Western during April of 1995. The end of the North Western closed the book on one of America's most fascinating railroads, the classic granger. While one can still witness the Heartland's agriculture industry served by trains names like the Milwaukee Road, Burlington, Rock Island, and Chicago & North Western have all disappeared through merger, liquidation, or buyout. Today, C&NW's key routes carry on under the UP banner, especially its Powder River coal basin line. 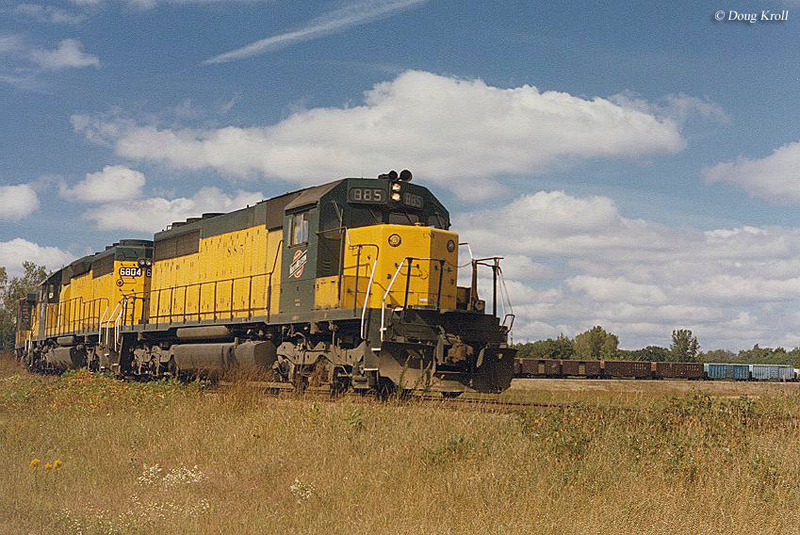 Union Pacific also paid homage to its predecessor by painting one of its new EMD SD70ACe locomotives in 2006 into a version of the railroad’s famous green and yellow company livery, given number 1995 after the year the railroad was acquired.